Hey! Guess what? This morning I rejoined the news team I worked with last week, to film the first interview that Adama Barrow has done since becoming Gambia’s new president yesterday. I got to shake his hand and offer him my congratulations. Thrilling, amazing, and a very small antidote to the horror of today. The interview was supposed to air in a 3pm broadcast, but it got pushed back indefinitely because the protests in D.C. stole the spotlight. And thank God for that. To everyone out in the streets of America today, I salute you and your civil disobedience. Keep it up! 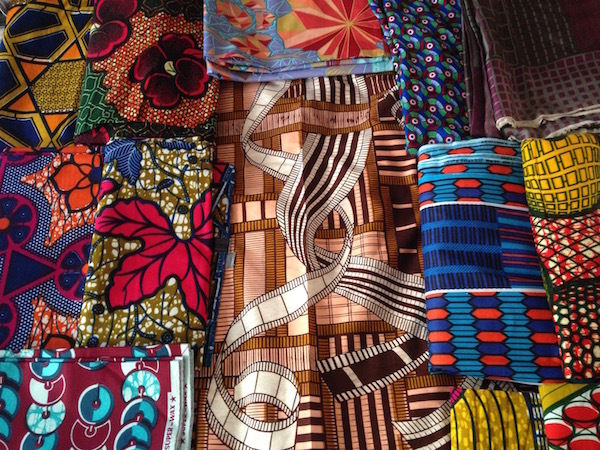 The photo above is of all the wax fabric I’ve accumulated during my sojourn in West Africa. Ready-to-wear, non-secondhand clothing stores are really few and far between in this region, and what people do instead is buy fabric and take it to a tailor with a photo of the sort of thing they want made. The tailor creates the custom order for a fraction of what it would cost in the United States. This concept is my dream come true, but I have been paralyzed by indecision over what to make with each piece of fabric, and during 11 months in Dakar I have yet to visit a tailor. I’m not sure I’m going to stay in Senegal much longer so I really need to get to one soon, but it’s become sort of emotionally painful to commit to cutting up such beautiful fabric in one way and not another. The Vlisco fabric that includes the film strip is especially difficult for me. I bought it not only because I love the colors and the pattern but primarily because it speaks to my life’s calling. If I use it for something small like a shirt or a throw pillow, the fabric’s content will become unintelligible and thus lose its meaning. But it’s not nice enough to frame, and I don’t want to make it into a dress, and pajamas seem a waste. Finally I decided I’ll bring it back to the States uncut and use it to reupholster the chair I inherited from my grandmother about 20 years ago and that has been sitting in my parents’ basement since. As for the rest, I spent a ridiculous amount of time matching clothing styles to fabrics, changing my mind, getting annoyed at myself, and finally forcing myself into decisions that I may or may not regret later. But at least this week reminds me that fashion is just another opiate of the masses and it does not matter one bit what I am wearing when there are totalitarian new world orders to resist. “Avoidance speech” is both a fascinating and terrible concept. 50 wondrous places to visit in 2017. The most beautiful public toilet in the world is all about the view. Here’s a BBC story about Cafe Cor Coumba that apparently inspired the story I was in. It was filmed by a friend! Three idioms across the world. Male applicants, feminine language. This article suggests changing the language; I would suggest changing men. A small-world story from my favorite museum’s blog. One of the main reasons I don’t want to return to the US is 24/7 work culture. This article offers sad evidence of that. Americans don’t use all their earned vacation days. That is so screwed up. “Fashion is just another opiate of the masses” – I love it!